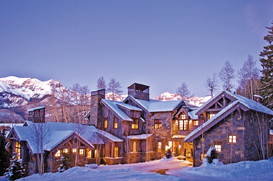 Telluride, Mountain Village and their surrounding areas boast a desirable array of high-end luxury homes. Within the Town of Telluride, there is an eclectic mix of remodeled historic Victorian residences, mountain modern homes, and posh condominiums – these luxury properties are newly built, on oversized lots with excellent views and proximity to skiing. Among Mountain Village, like no other resort, large private mountain estates on several acres are scattered along the ski trails offering A+ ski access. These homes are appointed with the highest levels of finish that money can buy, leaving no stone unturned. The upscale luxury homes of Telluride, CO are sure to impress. Home theaters, bowling alleys, swimming pools, spas, saunas, master suites, his and her closets, large garden tubs, outdoor living areas, custom kitchens, guest homes, and privacy are just a few of the many features that Telluride’s luxury homes have to offer. Most of the luxury condominiums located in Mountain Village are at the penthouse level with 360-degree mountain views, luxurious amenities, and convenience to the ski lifts and gondola.